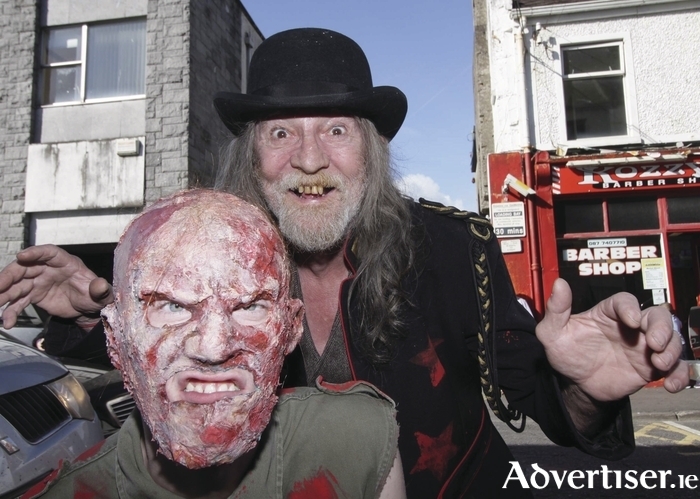 HALLOWEEN FAST approaches, that time of year when ghouls, ghosts and goblins, witches and warlocks, fiends and fright-mongers, of all shapes and sizes emerge to fill mere mortals with dread and horror...and Galway is not immune from their baleful presence. Indeed the Connacht Tribune printworks on Middle Street has been taken over by Carnevil, a nightly scare-fest and spookathon apt to make strong men quake and nervous souls faint clean away! The back story of Carnevil is as follows; a seemingly innocent travelling carnival came to Galway many, many, years ago, but chaos ensued when its side-show freaks escaped. Despite the best efforts of the local watch, this maniacal gang wreaked havoc upon the city, striking in the dark, vanishing in the night, leaving a trail of destruction and horror in their wake. Paralyzed with fear, Galway finally breathed a collective sigh of relief when the hellish carnival upped and disappeared one night. While the nightly reign of terror came to a halt, it was believed the deranged freaks had escaped to hide out in Connemara. Months later, visitors to the local convent on a feast day found the doors locked, and only when they managed to force entry did they discover the horrible truth - the much-dreaded freaks had invaded the convent and turned it into a grotesque lair of unspeakable horror, and apparently turned upon each other in some sort of frenzied madness. The scene was so gruesome, so shocking, that the building was boarded up, its shocking secret horror locked away...until now, when Carnevil again unleashes this Devil-spawned tide of terror on an unsuspecting populace. One of the fiendish imaginations behind Carnevil is Brendan Savage, and he took a few minutes away from plotting all kinds of havoc and psychic mayhem for his fellow citizens to tell me about the show. Brendan goes on to give an idea of what to expect when they cross the Carnevil threshold - it helps if you imagine him as Robert de Niro’s Louis Cypher from Angel Heart as he does so: “What they can expect is to be terrified. I’ve spent a lot of time researching and going into what frightens people. It’s quite amazing, different people are frightened by different things. When you go into Carnevil you are subjected to many different types, levels, and forms of fear and I think we’ve pretty much got everybody covered. “The show combines performers and special effects,” Brendan continues. “There are some areas which to the onlooker might seem as if not much is going on initially but then something will happen. We judge the show literally by ‘Are people screaming?’, On our first night, we opened the doors, waited a few minutes and the screams started. As people progressed through it they kept on screaming and came out terrified. The satisfaction rate seemed to be 100 per cent, the reviews on our Facebook page have been constantly five star. Carnevil runs most evenings at the Connacht Tribune Printworks from now until Halloween. Further details of times and ticket prices can be found at http://carnevil.ie/. Page generated in 0.0737 seconds.